Many professing Christians foolishly view Martin Luther (not to be confused with Martin Luther King Jr.) as a hero for his work in separating us from Roman Catholicism even though it was God who preserved His church. Not a crowd of reformers. Matthew 16:18- And I say also unto thee, That thou art Peter, and upon this rock I will build my church; and the gates of hell shall not prevail against it. Not only is this the issue, but there are obviously many Luther idolaters that don’t have the first clue of a lot of the doctrine which he taught. In this article, we will thoroughly look into these doctrines. There is much wrong with this ignorant statement. Yes, it is true that no matter what we do, we are eternally sealed with the gift of eternal life once we put our faith in Christ’s work on the cross, but even if you are saved, sin is still wicked, and God will still be disgusted with you if you “kill or commit adultery 1000 times each day.” I covered the “license to sin” heresy in this article. Martin Luther is right about the first part of the statement. Salvation is not of works, but he says that sin is less dangerous than good works and in the first statement of the article, he pretty much said to just sin away. Consider the following verse. Isaiah 5:20: Woe unto them that call evil good, and good evil; that put darkness for light, and light for darkness; that put bitter for sweet, and sweet for bitter! This isn’t so much a doctrine as it is an opinion, but it doesn’t make it any less cruel. He strongly endorsed the cruel treatment of peasants during the “Munzers Peasants War of 1525.” He claimed to be separating from Roman Catholicism, but supported the same thing they did to Chrostians who lived by the Bible and not by the doctrines.of wicked “popes” during the medieval inquisition. Martin Luther doesn’t seem like a hero to me. He seems like a vicious, nasty, horrible person. Marrying several wives DOES contradict scripture. These are two of many quotes in which Martin Luther attacks the scriptures including the book of Revelation. Not a smart move considering below. Revelation 22:19- And if any man shall take away from the words of the book of this prophecy, God shall take away his part out of the book of life, and out of the holy city, and from the things which are written in this book. Martin Luther also believed much Catholic doctrine. It would be wise to conclude that from doctrines 6-9, Martin Luther only left Roman Catholicism superficially, not doctrinally. Martin Luther was no hero. He did not save us from Catholicism. Stop giving the glory to this wicked man and give it to God. Since Martin Luther trusted the Catholic way of salvation, he obviously was not a saved man. Those 99 theses will not take him out of that fire. In the name of The Lord Jesus Christ (not Martin Luther) I write unto you. Amen. If you would like to know how to receive the gift of eternal life, click here. If you were told that your congregation was a “corporation of the state,” then what would you think? The phrase might boggle your mind a little bit at first, and then once you realize how wicked “the state” is, then it would be wise for a Bible believer to be bothered by it. There are many churches, especially the mainstream, but even some independent churches, that obtain what is called a 501c3 status. Many people have been deceived into thinking that in order to be an official church, one must obtain this status. Let me give you a quick rundown of what this status is. A 501c3 corporation is a non-profit organization that gains a tax exempt status under section 501(c) of the IRS code. Part 3 is specifically for religious, charitable, and educational organizations. There is already a major problem this far into the detail. Since true New Testament churches are not recognized as a legal entity, they are already exempt from tax. Wherefore, why would you go to the government to get permission to be exempt from a tax you didn’t owe to begin with? Something strange is going on here. The creator of a corporation is the State. The State is the sole authority and sovereign head over the corporation. The corporation is subject to the laws of the State which limits its powers. The corporation has no constitutionally protected rights. The corporation is an artificial person. The corporation submits to a State Charter declaring it is a creature of the State. The corporation is created for the benefit of the public. The corporation is a State franchise. The corporation is a privilege granted by the State. Look over each of those definitions carefully. Now replace “corporation” with “church.” When you sign that 501c3 contract, you are literally owned by the state. They have legal authority to tell you what you can and can’t preach. You surrender all of your constitutional rights. Why would anyone want to make their congregation a corporation of the state? As it is stated earlier in this post, many have been deceived into thinking that they need a 501c3 status in order to become an “official church.” First thing wrong with this statement, the Church is the body of believers. Next thing is, there is nothing in the Bible that states you need to gain such a wicked status. Anyone with a basic understanding of the Bible should know WAY better than this. Why do you need permission from our evil government to be called a Church. There is nothing in me that doubts that this status is being used by the government to make an attempt to control preachers and their congregations as part of setting up the New World Order. They are trying to keep sound doctrine out so their way can be paved. 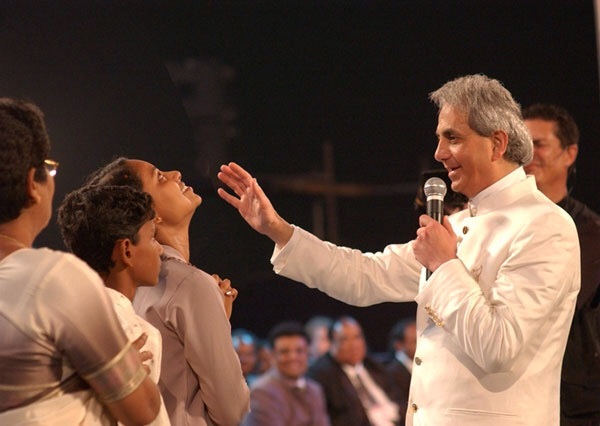 I want to share with you a comment I recently read on a video of Benny Hinn. I do not know if this person is saved or not, I even sent him a message, but his comment destroys what Benny Hinn does it said “I am a Christian with a serious 20 year old injury and had attended this crusade in the hopes of a healing. I was sitting in the fifth row from the front. I had observed Mr. Hinn waving his hands and his on-stage assistants would fall over at this gesture. I did however notice that these stage hands were looking for Mr. Hinn’s hand gestures and thought to myself that this was phoney. Later, a couple of his assistants would touch the centre pews and the people in the entire row would collapse in their seats. I prayed that if this was not of God that it would not affect me and if it was, then fine. The second row collapsed, then the third and forth. Now my Row. Everyone in my row collapsed except myself and the person to my left. At that point Mr. Hinn was frozen on stage and just stared at me and I stared right back at him. ” Well played sir, but I hope you are saved, and if you aren’t, I pray you get saved. Now onto a scriptural refutation of this chaos. These fake healers, like Benny Hinn, would have people decieved into thinking that there is physical healing in the atonement, and love to quote the following verse and prophecy of Christ’s work on the cross to support this doctrine. Isaiah 53:4- surely he (Christ) hath borne our griefs, and carried our sorrows: yet we did esteem him stricken, smitten of God, and afflicted. There is a major problem when charismatics quote this verse though. Grief does mean sickness, and sorrows does mean diseases, but this verse is a prophecy of the healing Christ would do PRIOR to His work on the cross, in which we have Salvation, not physical healing. This is cleared up in the following verses in which the prophecy is fulfilled. Matthew 8:16-17- They brought unto him (Christ) many that were possessed with devils: and he cast out the spirits with his word and healed ALL that were sick: That it might be FULFILLED which was spoken by Esaias the prophet, saying, Himself took our infirmities, and bear our sicknesses. All throughout the Bible, it is made very clear what Christ’s work on the cross is for. It was for Salvation, not physical healing. Before we reach conclusion, I want to share one more verse with you. John 15:24- If I had not done among them the works which NONE OTHER MAN DID, they had not had sin: but now have they both seen and hated both me and my Father. Psalm 20:4- Grant thee according to thine own heart, and fulfill all thy counsel. False doctrine made out of this, would be the “follow your heart doctrine.” Let us now compare scripture to expose this doctrine. Jeremiah 17:9- The heart is decietful above all things, and desperately wicked: who can know it? Follow your heart is one of the worst pieces of advice that you can give. If you have the desire to murder someone, then should you follow your heart then? No, I didn’t think so either. Now let us go back to Psalm 20 to find out what this verse really means. Psalm 20:1-4- The Lord hear thee in the day of trouble; the name of the God of Jacob defend thee;  Send thee help from the sanctuary, and strengthen thee out of Zion;  Remember all thy offerings, and accept thy burnt sacrifice; Selah. Grant thee according to thine own heart, and fulfil all thy counsel. This whole passage is a prayer to God for strength, with an attitude of God’s will being done (verse 4). Not a piece of encouragement to follow your heart. Now, if you use the NIV, like many people who misquote this verse, then the passage would read …. That is a complete change of doctrine. Completely it from a prayer to God to words of encouragement to people. Notice how it also says “may he give you the desire of your heart.” Again the human heart is “decietful above all things, and desperately wicked” according to Jeremiah 17:9. Do not be decieved by what I call “one versism.” Compare scriptures to find out what that verse really means. I plan on doing more of these posts exposing dangerously misquoted verses. In the name of The Lord Jesus Christ I write unto you. Amen.